Press release from St. Patrick’s Montessori Nursery School. 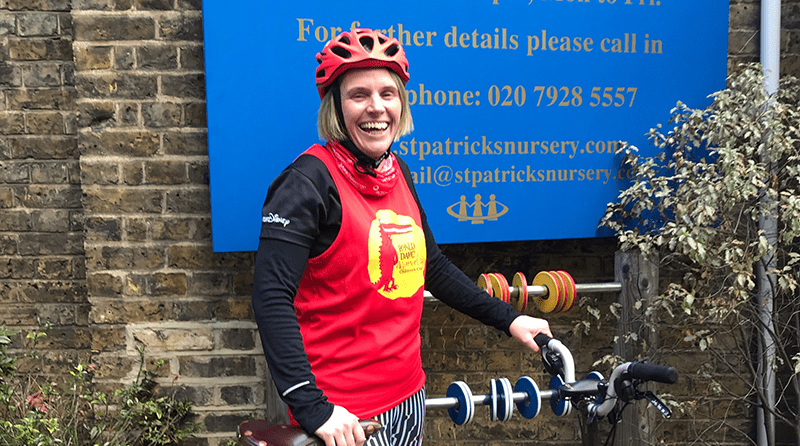 On Saturday (April 5th 2019) a London Nursery Manager embarks on a London to Paris Bike Ride on what is her normal commuter bike. This is an awesome cycling challenge that Lynnsey Fitzgerald is taking part in to raise awareness for Roald Dahl’s Marvellous Children’s Charity. She’ll spend 4 days in the saddle, cycling 300 miles from capital to capital. Her journey begins in at the nursery in Waterloo, central London with the route taking her through glorious English countryside as Down to Newhaven before crossing the Channel to Dieppe. Once across the water, Lynnsey will start cycling ‘French style’, remembering to keep to the right on her trustee Brompton. She’ll cycle along quiet French country lanes, through traditional market towns with views of the rolling green hills of Northern France, passing the war memorials and cemeteries of the Somme. A spectacular finish awaits as she reaches the home stretch around the Arc de Triomphe and down the Champs Elysées, before reaching the piece de resistance, the Eiffel Tower, which marks her finish. The days in the saddle may be long, but the celebrations of achievement in Paris once she has completed her journey will help the saddle soreness wear off quickly!